Indian Navy is going to recruit fresher candidates in India for SSC (Education) & PC (Logistics) Officers Posts. So, those candidates who are willing to work with this organization they May apply for this post. Last Date of Apply 10-February-2018. Total numbers of vacancies are 38 Posts. Only those candidates are eligible who have passed M.Sc. (Physics/ Nuclear Physics/ Maths/ Operational Research) with Maths in B.Sc or M.A. (English) or BE/ B.Tech (Electronics & Communication/ Electrical & Electronics/ Electronics & Instrumentation / Electronics & Telecommunications/ Electrical Engineering). 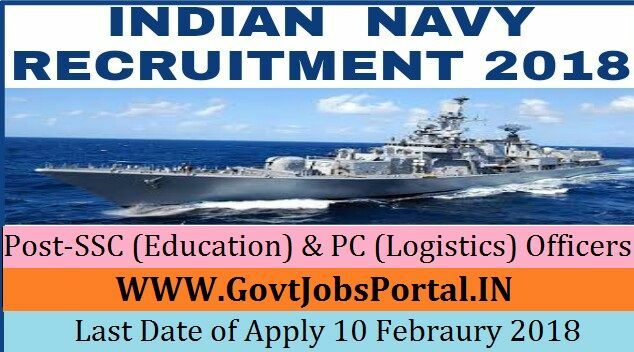 Indian citizen having age in between 17 to 26 years can apply for this Indian Navy Recruitment 2018. Educational Criteria: Only those candidates are eligible who have passed M.Sc. (Physics/ Nuclear Physics/ Maths/ Operational Research) with Maths in B.Sc or M.A. (English) or BE/ B.Tech (Electronics & Communication/ Electrical & Electronics/ Electronics & Instrumentation / Electronics & Telecommunications/ Electrical Engineering). What is the NAVY Selection Process job?